Students learn hands-on at the Michigan Engineering Zone. Image: University of Michigan. More students in Detroit Public Schools will be participating in after-school programs in science and engineering, thanks to a $250,000 grant from Google to the Michigan Engineering Zone, a makerspace project of the University of Michigan College of Engineering. The nearly 48,000-student school district is working with the MEZ as well as FIRST Robotics to get hundreds of students interested in pursuing STEM careers. The MEZ provides space, mentorship and tools to students as they build and test robots to compete in the FIRST Robotics competition. 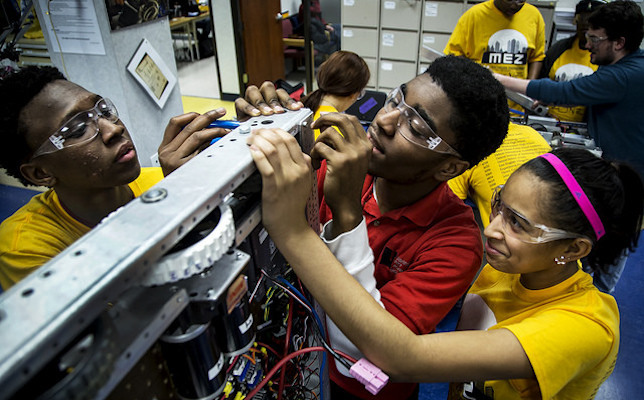 The MEZ just wrapped up its eighth season with 18 high school FIRST teams and more than 275 students from the Detroit area. A majority of participating high school seniors were accepted into two- and four-year colleges and universities and plan to pursue careers in science or technology. The grant from Google will “allow the program to build the infrastructure to expand by 33 percent to reach a total of 500 students per year,” according to a university statement.